Professor Kleiner presents the three options for the course’s term paper, which fall into two main categories: a research paper or a project to design a Roman city. For the research paper, she suggests cities and monuments not covered or mentioned briefly in the lectures, which embody some of the themes and issues raised in the course. Such topics include, in the Eastern Empire, the Roman cities of Corinth and Gerasa (Jerash), the Library of Celsus at Ephesus, and the Temple of Bel and the tower tombs at Palmyra. In the West, possible subjects are the Villa of the Papyri at Herculaneum; funerary architecture in Pompeii; a Roman villa at Fishbourne; Roman baths at Bath; and the private houses at Vaison-la-Romaine. 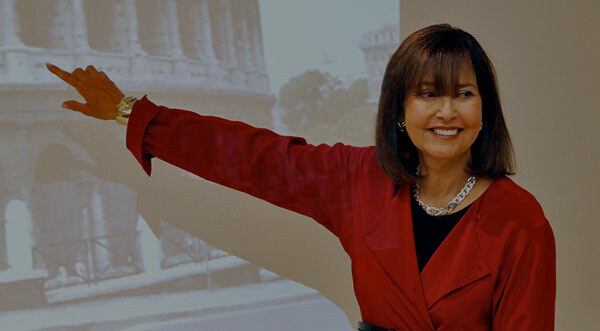 Students may also study a site or monument of their choice, provided that the topic is pre-approved by Professor Kleiner. The lecture concludes with an overview of the “Design a Roman City” option, in which students draw or generate plans and other representations of a hypothetical Roman city of 10,000 inhabitants, accompanied by a paper supporting their proposal. Professor Diana E.E. Kleiner: Good morning everybody. We will be returning the exams on Thursday. They’re being graded now and we’ll return them to you on Thursday. And I’ve always found, I’ve found in the past, that having–once we finish the midterm exam, and all of you have had a chance to go back over the material, mastered it, is the ideal time to begin to talk about a selection of a paper topic, a term paper topic. And I’m going to concentrate on that particular issue in today’s class, the choice of a paper topic. Right before Spring Break is also a good time to begin thinking about this, because there are a lucky few of you in here who are actually going to Rome, for Spring Break, and there are others that are heading home to California, possibly near Malibu – might have a chance to go to the Getty Museum, in Malibu, which is based on an important villa, ancient Roman villa at Herculaneum, as well as other travels that may give you some ideas about potential paper topics. And don’t underestimate just the experience of architecture of any period, in terms of inspiring you, as you go to whatever city you’re headed toward, or even whatever small town you’re headed toward. Looking at what’s around you can be a stimulation to making a selection on a paper topic. So I want to go over that with you today. Also I’m going to show you some magnificent parts of the Roman Empire, as a prelude to what we’ll be doing when we get back after Spring Break. And that is, although we’ll spend–we’ll do one lecture on Hadrian and the Pantheon, and Hadrian’s Villa at Tivoli, and one on a colony in Italy, namely Ostia, the port of Rome. From that point on we’ll make our way around the rest of the Roman Empire. We’ll go to North Africa, we’ll go to Jordan. We’ll go to other parts of the Middle East. We’ll go to France and Spain. So we’ll be spending spring going around the Roman Empire to some extraordinary spots. And I think by introducing you to some of those today, vis-à-vis the paper topics, will get you in the mood, I hope, for that kind of whirlwind tour that we’re going to take in the second half of this semester. Now I’d like to spend the rest of the time again showing you some magnificent places, giving you a sense of the three options for the paper topics, and specific monuments and sites that I hope you’ll consider as possibilities for your paper. And again, as I mentioned, it’s also a good chance for us to begin to experience the provinces of the Roman Empire. Obviously I’ve chosen topics that are ones that for the most part–there’s one or two exceptions–but for the most part are not topics that I’m going to be going over in class, to give you an opportunity to look into a part of the world that we may not cover in class, but also to be able to use what you have learned about Roman buildings in general to decipher buildings that you haven’t yet seen before. The first of these–well the first option; there are three options, as I mentioned before–and Option 1 is a straightforward research paper that is comparable, obviously, to research papers that you’ve done, not only in other Art History courses, but in other History courses and other–whatever courses, even science courses–a straight research paper in which you have a topic that you do a considerable amount of reading on, focused reading, on that particular topic, and I give you bibliography for all of these. And, by the way, all of these, pretty much all of these bibliographical sources are on reserve, in the Art and Architecture Library, for this course. With a group this size, obviously if a number of you choose the same topic, I don’t want a situation and whoever–the early bird catches the worm–whoever gets the book out of Sterling has it and nobody else can get to it. So I have put the books on reserve for this course. I know that creates other challenges, because you can’t take it home with you, but–and it means you do need to share–but it will mean that it will be there for you, in the library. In some instances there are second copies at the University. So again, in that sense, the early bird can catch the worm, if there is a second or third copy that can be checked out. So I do urge you, if you have a pretty good sense of what it is that you may want to work on, and want to pick up a book or two before you leave for Spring Break, the next couple of days would be the time to do that. So the first topic–so under Research Paper, again a straightforward research paper in which you do some reading, you do some looking, you think about this monument; you think about its own special characteristics, as well as where it fits into in the evolution of Roman architecture. And one hopes, of course, that you’ll do both synthetic – once you’ve done your reading and your research, that you will present this work of architecture synthetically. But at the same time I hope that you will have a thesis, that there will be something that you will come up with on your own, a major point, a major focus, that you’ll want to have and that you’ll want to make. And that you’ll want to use the paper toward arguing some thesis of your own–even though, for the most part, it will be a synthesis of what you read, what’s understood–and a placement of it. Since you now know Rome itself particularly well, if you choose a topic of a building, or a group of buildings that are outside Rome, the relationship of what’s going on, on the periphery, to what is going on in the center, and the relationship of center to periphery. So the first topic I give you under Research Paper is the Roman city of Corinth, which is in Greece. This would be a good paper topic for the classicists among you; and I know there are some. Anyone who’s into–who’s fairly well steeped in Greek culture, as well as Roman culture and civilization, who might want to look back at a Greek city, a city that was already very built up under the Greeks, as early as the Archaic Period. This is a view, for example, of the Greek Archaic Temple at Corinth. So a Greek city, a very well developed Greek city, that is eventually taken over by the Romans, and the Romans remake it in the Roman manner. They add typical Roman buildings to it, create a kind of mini Rome, in Greece. But it’s interesting to see the way in which those new buildings blend with those that were built there earlier. I also mention here not only the Archaic Temple at Corinth, but also the so-called Isthmus at Corinth. You might remember, from our conversation about Julius Caesar and the architecture that he built, that Julius Caesar was the one who built a canal at the Isthmus of Corinth. And the canal that is still visible and used at Corinth today–which you see an excellent view of on the left-hand side of the screen–is essentially the same canal that was built initially, or begun initially, by Julius Caesar. So that gives you some sense of a Roman addition to the scene. And I show you just one other example. There are quite a number of buildings preserved from Corinth, Roman buildings. So one could do–for a paper like this, one could do an overview of the Roman city, all the pieces of the Roman city, how the urban fabric worked, or you could choose one or two buildings at Corinth, at Roman Corinth, to concentrate on. I show you, for example, a view of the remains of the Roman Baths at Corinth. And what’s interesting about these–and you can pick this out on your own already, just by looking at this one view–what’s interesting about these is although they look back to Roman bath architecture, in Italy, you can see that this bath is made entirely of cut-stone construction, which is quite different from either the small baths we saw at Pompeii, the Stabian Baths or the Forum Baths, or the later imperial baths – the Baths of Titus, for example, that we’ve already explored, where concrete construction was used. Here stone was used. Why was stone used? Because there was a very long tradition, already begun in Greece, from the Archaic Period through the Classical Period to the Hellenistic Period, of using stone for architecture. And the architects, in this particular part of the world, because stone was so readily available–and especially marble, but other kinds of stone as well–so readily available, and because the architects and designers in this part of the world were so skilled at carving stone, it was natural for them to use stone in their construction. So we see that they are not seduced by concrete domes and the like–don’t use concrete in their architecture, which you’re going to see, not only today but in the future, is really an Italian phenomenon. Concrete is picked up very sparingly in the Roman provinces. Stone construction tends to be the norm, for the most part, and we see that at Corinth. So the whole question of building materials becomes very important. But one would ask oneself, if one looked at the Baths at Corinth for example, what is the plan like? How similar is it to the small baths that we saw at Pompeii? How similar is it to the imperial bath building, that we saw the symmetrical and axial–imperial bath building that we saw, for example, under Titus. What kinds of materials was it made of? What is the layout of rooms; the men’s section, women’s section? All the obvious questions that you would want to put to this particular structure. Also in the eastern part of the Empire, the city of Ephesus, in what was ancient Asia Minor, modern Turkey, on the western coast of Turkey. An extraordinary place. It too had a very long history, not only historical and cultural and political, but also in terms of its architecture; built up already in the Greek period, just as Greece itself was. And one of the most famous temples at Ephesus was the Temple of Artemis, at Ephesus. And I show you a coin of that temple here. It was renowned worldwide, and pilgrims came from all over the Hellenistic and Roman world, to see it. And I show you a representation on this coin of what the Temple of Artemis, in Ephesus, looked like. And you can see here that it had eight columns across the front. They were Ionic columns; at least at one point. It was rebuilt over a number of years and that got changed over time. But we see it here, with its Ionic columns, with its pedimental decoration, and with the columns spread out in the center, in order to reveal the cult statue of Artemis. And what a statue it was. I show it to you, a copy of it. A very well endowed Artemis, as you can see here, on the left-hand side of the screen. And there are tons and tons of copies of these, and this is one of those that gives us a very good sense of what this cult statue of Artemis, in this famous temple, looked like. And you can see that she’s had a very long afterlife. It’s very tempting to use her in all kinds of later ways. And as you can see in this wonderful view of the Villa d’Este, at Tivoli, in Italy–which is very close to Hadrian’s Villa at Tivoli–a Renaissance area with lots of fountains and so on, and you can see how they’ve taken Artemis, or Diana of Ephesus, and made her into a fountain. So she comes up in all kinds of later contexts, as you can see. With regard to the Roman city, the city of–the Roman city of Ephesus is extremely well preserved. It’s one of the best preserved Roman cities today, up there with places like Pompeii and Herculaneum. But, as you can see from two buildings from Ephesus, it is very different from either Pompeii or Herculaneum. It is essentially a marble city, and it’s another example of the fact that in Greece and in Asia Minor, marble construction and using the traditional language of architecture, as developed by the Greeks–columns and pediments and walls and the roofs that they support–remains the way of going about construction. And I show you here, for example, the very well-preserved Arch of Augustus at Ephesus, which gives you the sense of the kind of stone construction that was used for that. And perhaps more interesting is the shrine that I show you–the shrine or the temple–that I show you here on the right, which is the Temple of Hadrian, the emperor Hadrian, at Ephesus, that was put up in honor of Hadrian. It’s a very small temple, more a shrine. And what’s interesting about it is again that it is made out of stone; think of this in relationship to the–we haven’t looked at it, but I know it’s a building you all know well–the Pantheon in Rome, which of course is one of the greatest concrete buildings the Romans produced, or is the greatest concrete building the Romans produced. If you compare that with its very large scale, with its concrete construction, to this, you get a very good sense of the difference between Rome and Ephesus, in the Hadrianic period. This is again a very small building. You can see it’s made entirely of stone. It has columns, it has pilasters. It is very highly decorated; in fact, almost overly ornate, with that decoration almost dematerializing the architectural members. And you can also see a motif that we have seen before in painting, but never before in built architecture, and that is a straight lintel, and then the arcuation of the lintel, and then the straight lintel again; and that is housed in a pediment, or least part of a pediment. We can’t tell, but you can see on both sides the pediment begins to rise, but it’s not completed. Now whether it’s just broken off, or whether it was what we would call a partial or broken triangular pediment, we’re not absolutely certain. My guess is it was a broken triangular pediment. So we have this arcuated lintel emerging from the broken triangular pediment. We’re going to see that this motif of straight, arcuated lintel is very popular in the Hadrianic period, and even brought to Italy from these experiments in the East. But again we saw this in painting. We saw this in that painting that was on the midterm, Cubiculum 16, for example, already in paint. Now we see it in built architecture. But what we see in the eastern part of the Empire is the way in which architects used the traditional language of Greek architecture–columns, pediments, lintels–and do something entirely different with them. And it’s very different from built architecture in Rome, of the same period. Now the building that I recommend, if you want to work on Ephesus – there are other possibilities, you could work on that Temple of Hadrian, for example–but the one that I think has the richest opportunities for an outstanding paper, and an interesting paper as well, and an interesting research adventure, is the Library of Celsus in Ephesus. You’re students, you spend a lot of time, I hope, in libraries, and so you have a sense of Sterling and the way it works; if you’re not always online, instead of going to the library these days, which is a temptation that even I fall into the trap of, on a fairly regular basis but–using the Internet instead of taking that extra step to get to the library. But I really urge you, it’s very important for this topic. You will not find–for these papers, you will not find–you will find a lot of interesting things on the Internet, and I really do urge you to use it. But, at the same time, you will find that you really do need to go to the library and get out a variety of books to help you do a good job on this paper. The Library of Celsus, because of your general interest in libraries and because of the fact that we haven’t been able to talk, in this course, about libraries in the ancient world, the most famous of which, of course, was the library at Alexandria, upon which all other ancient libraries appear to have tried–appear to have measured themselves. But we see lots of libraries in Rome and around Italy and around the Empire; Greek and Latin libraries. Libraries that are either part of private villas sometimes–we’ll see that at Hadrian’s Villa, for example, or in fora, like Trajan’s Forum, which we’ll look at on Thursday. But also large enterprises that served a city, such as this one. This is the Library of Celsus, in Ephesus. It is called after Celsus, because Celsus–a man by the name of Celsus, C-e-l–s-u-s–was the patron of this particular library that bears his name. He was the benefactor who wanted to splash his own name on this library, the purpose of the library being a library for everybody who lived in Ephesus. We see a plan–these are both from Ward-Perkins–a plan, and also a restored view, of the interior. In the plan you see its inside. It’s a rectangular space with a niche, with columns in that niche; columns around the perimeter of the room; and then columns, as well as a staircase, on the front of the structure. In this restored view you get a better sense of what it would’ve looked like inside. You see that niche here. You can see now that it’s a two-storied niche, with columns on two stories, and with a semi-dome with coffers, at the top. And then a series of tiers, with rectangular storage areas here, with shelves, where they placed those–remember, there were scrolls, not books. So they piled the scrolls on these shelves, and then each of these rectangular areas had a wooden door that would cover–would close and keep those scrolls protected, unless someone wanted to check them out, or consult them, or whatever. We see it also had a flat roof with a coffered ceiling. Now what’s also very interesting about this library, and essentially unique, is that Celsus not only wanted to give this as a benefaction to his city, for the public good, he decided he also wanted it to serve as his tomb. Now I’ve told you that people made strange choices vis-à-vis their last resting places, and Celsus decided that he wanted to be buried in his library. So he provided–beneath that central niche there was a burial chamber, and he was indeed buried in his library. So this is not only a library, it’s also a tomb, which again makes it a particularly interesting topic, I believe. It had fallen, the building had fallen down, and about in the 1970s it was still on the ground, in bits and pieces. In more recent decades they have taken those pieces–there were tons of them, hundreds and hundreds of pieces–and the authorities, the archaeological authorities, have put this building back together. But they’ve put it back together with its own architectural members and so on. And this is what you see today, if you go to Ephesus. It’s an extraordinary structure. You can see that it’s entirely made out of marble. This is the façade of the Library of Celsus; it’s entirely made out of marble. We can see that it is two-tiered, with columns supporting straight lintels, down below, and then in the upper tier a combination of arched–of arcuated pediments and rectangular pediments up above, to give it some variety. And you’ll also see something very interesting here, which is although the architect has used the traditional language of Greek architecture–columns and pediments and the like, which is very traditional, when you compare it to the sorts of concrete buildings going up Rome–but at the same time has injected motion into this façade, by having a series of projecting bays, receding bays, projecting bay, receding bay, creating a kind of undulating in-and-out effect, across the façade. And then has done something quite interesting, which is to place the columns in the second tier, not immediately above those in the lower tier, but straddling the spaces in between them, above the receding bays rather than the projecting bays, which injects still more motion into the upper part of the structure, in contrast to the lower part. And you can see also the–again marble construction here, variegated marble used for the columns; so very much a marble building. And marble, very high quality marble was more readily accessible in Greece and in Asia Minor than anywhere else in the Roman world. This is another wonderful view. We’re standing below, looking up from the first tier to the second tier of the Library of Celsus. And as you look at this, you probably are thinking: “Hey, architectural cages at the top of Fourth Style Roman wall painting.” We’ve seen this before, but only in painting. We haven’t seen anything like it. The closest we got is our look at the Forum Transitorium, or the Forum of Nerva, in Rome, where I showed you those columns that project out of the wall, and have projecting entablatures, and that kind of in-and-out effect. I said that was the first example in Rome of what we might call the “baroque” trend in Roman architecture, where this motion is injected into the façade. But we see this very naturally in Asia Minor, over and over again. We see it here. So an example of something in built architecture that we’ve seen earlier in painted architecture, and which is going to have–as we’ll see, I have an entire lecture on the baroque architecture of Roman antiquity, where we look at a series of buildings around the provinces that all make use of traditional vocabulary, but use it in a very vibrant way, as you can see here. And then there are, as you probably already noticed, statues that are placed in the niches on the façade; in this case of two women. The interesting question, for anyone working on it, who are these? Their names are given, or they have inscriptions down below, identification, in Greek. And you can also see, with these details, how elaborate these were, how they, just like in the shrine, in the Temple of Hadrian, in Ephesus, the use of decoration covers almost every available space and helps to not only decorate or ornament, but dematerialize the architecture elements. Something again we saw in painting, Third Style Roman painting. Here we see it–and on the Ara Pacis; so we have seen it in architecture–here we see it in architecture in the Western [correction: Eastern] Empire. Another very interesting city, and issue, is in the Roman City of Gerasa, or Jerash, in what is today Jordan. I show you–we will look at a couple of buildings in Jordan, later in the term, but not at this particular one. I show you a plan of what the Roman City of Jerash looked like, and where the Roman buildings were located. You can pick out all the obvious components of a miniature Rome. You see a hippodrome, for example, over here, with its hairpin shape. There was an Arch of Hadrian over here. There were two theaters, the North Theater over here, and there’s another theater somewhere there, the South Theater, up there. And you can see that they conform to the shape of a typical Roman theater. You also see there was a temple to Artemis here as well. There are a couple of tetrapylons. We haven’t seen tetrapylons in Rome, and in fact the Romans didn’t build tetrapylons in the city. A tetrapylon is a four-sided arch that is made specifically to span two streets, so that you can go through the arch. And the arch is right over the intersection of those two streets, so that you can drive your cart, or walk, right through the arch on either street, either of the two streets. These tetrapylons were very popular in the eastern part of the Empire. We’ll see a number–we’ll see a couple of them today, and others in the course of the term, and you see that here. And for anybody interested, both in Jerash and in tetrapylons, I recommend–I’m not going over the specific references here, but if you don’t–you probably didn’t bring this today, but on the web portal you will find bibliography for each one of these topics, and again, as I mentioned, most of these are on reserve for the course. I recommend, in particular, the book by William MacDonald, called The Architecture of the Roman Empire, Volume 2, in which he focuses specifically–anyone working on one of the cities in the East, the eastern provinces, will find this book very valuable. Because he, in very poetic language, he is able to conjure up the way in which these cities were planned, the way in which these buildings interacted with the streets of the city, and the kind of vistas and visual kind of views that were carefully orchestrated by the designers of these cities, as well as the ways in which they wanted to move people around those cities. I think you’ll find that book particularly valuable. Let me just go back for a moment. I just want to show you that plan one more time, because eventually I am going to show you the Forum of Gerasa, which you see is located right over here, and the shape of that forum is particularly interesting, as we shall see. Just a couple of buildings from Gerasa. On the left-hand side of the screen, the Arch of Hadrian, which you can see, once again, stone construction here; with large projecting columns; niches on the second story; contrast between larger order and smaller order. Here we again see projecting columns with projecting entablature, but then a pediment that is recessed. So again, this playing around with the traditional language of architecture, in a way the Greeks themselves would not have done. Same happens up here. You have tall projecting columns with a triangular pediment, but a triangular pediment that is made up of projecting wings on either side, and then the central part of the pediment is placed in depth. Here a view of the fountain, or the nymphaeum, of the city of Gerasa, where you can see again the use–just as the Library of Celsus–the use of columns, in this case sets of columns that are placed one on top of the other, in two tiers. There would’ve been a columnar display here, probably–certainly also in two stories, on the interior of this building. Now this is the part of Gerasa that I think is most interesting, and that is that it has an oval forum; an oval forum, a forum in an oval shape. Now we’ve seen ovals before, for amphitheater architecture, the elliptical plan of an amphitheater, but we have not seen–and we’ve seen octagonal rooms, and we’ve seen round rooms–but we have not seen the Romans in Italy use the oval for anything other than amphitheater architecture. And yet we see here this wonderful forum in Gerasa that consists of an oval, which is defined essentially by a series of columns on a curve. So placing of columns, placing of the traditional language of Greek architecture along a curve, which we’ve seen before. We saw that at Palestrina, for example, but we see it here, with this oval shape. And the other thing that you see in this view, that is so interesting, is the fact that many–most of the streets in the cities in the eastern provinces are colonnaded streets, are streets that have columns all along them. We never, ever see this in Italy. There is no ancient Roman town in Italy that has a colonnaded street. So we begin to see these interesting differences between Rome and the provinces. Why is this? It’s interesting to ask ourselves why this might be. I think again it probably has to do with the fact that there was a long tradition, in Greece and in Asia Minor, for Greek architecture: Greek architecture made out of stone, using columns, for the most part. And that was something that they were used to. They liked it, and they continued it on. But they began to do it in a different way. The Greeks would never have built an oval meeting or marketplace, but here we see the oval. So this combination of the idea of the oval, probably from amphitheater architecture, combined with the traditional language, the traditional vocabulary, of Greek marble architecture. Another extraordinary site is the site of Palmyra, which is in–P-a-l-m-y-r-a–which is in modern Syria. And I show you a view of the ancient remains of Palmyra, as they look today. And you can immediately see that Palmyra, just like Gerasa, has colonnaded streets. Here’s the street. You can see all of the columns along it, as well as a series of large buildings that are part of the Roman structures that were added to the city of Palmyra, in Roman times. Here’s an example of one. This is a stone arch at Palmyra, and you can see that the stone arch has been made part of that colonnaded street. And the columns that lead up to it create a very interesting vista toward the arch. And then you can see–this is very interesting, we also see this quite commonly in the eastern part of the Empire–not only do they have columns, but they place brackets on those columns, that project out from them, and those brackets were meant to hold honorific statuary: so statues of some of the famous people of the city, or magistrates or whatever, of the city of Roman Palmyra. I mentioned a tetrapylon, a four-sided arch that would span two streets. We see one of those here, a very well-preserved tetrapylon, in Palmyra. And you see that once again they’ve used the traditional language of architecture: made out of stone, with columns supporting straight lintels, that serve–and placed on stone bases, as you can see here–that serve as the four sides of that tetrapylon. There would’ve been some roof on top of this, of some sort; or maybe not, I’ve forgotten whether that was the–I’ve forgotten what people think about this particular arch, whether there was–some of them have roofs and some of them do not. I don’t actually recall what the case is with this one. But it gives you again a very good idea of this tetrapylon arch that was so popular in the eastern part of the Empire. But the building again in Palmyra, that I think is by far the most intriguing, and makes a perfect paper topic–because one can try to decode which aspects of this are Roman and which aspects of this are local, and that’s essentially the name of the game when you try–when you go out into the Roman provinces, to try to determine what it is; in what ways has what’s going on in the capital had impact on what’s happening in the provinces, and what local traditions are so strong that they continue to exist, and even resurface, in some of these buildings? It’s usually a coming together of both of those elements–elements from Rome and local elements–and the way in which those co-exist and end up creating an entirely different architectural phenomenon; which is what we see in this building here. This is called the Temple of Bel, B-e-l, at Palmyra, again in modern Syria. And you say to yourself, “Well who is Bel?” Well Bel is a god, and that tells you something already. Bel is a local god. So this is not a temple to Jupiter or to Jupiter, Juno, and Minerva. This is a temple to Bel. So that already tells us something about this structure, as it goes up in Rome, that they are–as it goes up in Palmyra, during Roman times, that they are interested in commemorating and honoring a local god. If we look at the plan–and maybe you can help me here with this–if we look at the plan, and we think back to what we know of typical Greek, Etruscan, and Roman temple architecture, we should be struck by this plan. What is it that strikes us? What elements strike us about this particular plan? Anyone? Yes? Student: The porch goes all the way around. Professor Diana E.E. Kleiner: The porch, the staircase? The podium you mean? The podium. Professor Diana E.E. Kleiner: The podium. The podium goes all the way around, and the columns go all the way around, and–you can see in this restored view–the staircase goes all the way around. So the podium, the staircase and the columns–which are freestanding, as you can see here–go all the way around. So that is characteristic of what kind of temple architecture? Greek: Greek temple architecture. However, what else do we see that’s curious? This is not entirely a Greek temple type, it’s–yes? Professor Diana E.E. Kleiner: The cella. Professor Diana E.E. Kleiner: The cella is here. We have a single cella. We have a staircase, an additional staircase, on one side, which leads into the cella, from the side; not from the end, as we usually see. You usually enter from one end, one short end, and you have the apse, or the place where the god’s statue was kept, on the other side. But here we see a staircase that’s placed in the center–and it isn’t even quite in the center, it’s actually slightly off-center–on one of the long sides of the temple, which we have never seen before. So we have this interesting location of the other staircase, but also this combination of a staircase that goes all the way around, in the Greek manner, but then a kind of façade-orientation, by the placement of an additional staircase on one side of the monument. So a very schizophrenic building, in that regard. And the list goes on and on. Let’s look at the restored view. What do we see here that’s curious? Anyone? We have tall columns, with capitals. Look at the doorway. Can you see? I don’t know how clear it is to you, from where you sit. What’s happening above the doorway? We have additional–we have the upper part of the column and the capital, truncated, placed on top of the doorway. That’s strange. How are we meant to read that exactly? We’ve never seen that before. And look at the top. We have crenulations on the top of the monument. And at the very top we have some kind of a deck up there, that may have been used for something having to do with the worship of Bel. So one asks–so we see this interesting combination of the influence of Greek temple architecture, Roman temple architecture, and local practice. And so one would want to ask oneself, or one would try to find out what one could, about the worship of Bel, and about whether there were any earlier temples of Bel here, and whether any of these features have to do with local practice. The building still stands, or part of it, and you can see it here. Here you see that doorway that we were looking at just before, some of the columns, and you can see the kind of very nice honey-colored stone, out of which the Temple of Bel was made. Another terrific topic–and for anybody who lives on the West Coast and is going home to the LA area for break. You probably have already been to the Getty Museum. You can go again. But if you have never been, it’s an extraordinary–this would be a perfect time to go. The Villa of the Papyri in Herculaneum, a villa comparable to some of the villas that we’ve looked at this semester, whether it’s Boscotrecase, or the Villa Jovis on Capri, a very important villa in Campania, of the early Roman period. The Villa of the Papyri is so-called because of papyrus fragments that were found there. The owner of this particular villa had his own library–we’re back to libraries again. And by the way, on the bibliography, there’s a particularly good book by Lionel Casson, C-a-s-s-o-n, on the libraries of the ancient world, that anybody who works either on Ephesus or this will probably want to take a look at. He has his own library here, and there were scrolls from that library, especially from one specific author, that were found there, and it is because of those papyrus fragments that the villa got its name, the Villa of the Papyri, in Herculaneum. The excavations–excavations were done some time ago of this villa. A plan was drawn of the villa at that particular time, but the excavators found that noxious gasses were starting to be emitted from the ground, and there was a great–it was a health hazard. And so after they unearthed it, after they drew it, they covered it back over again. And it’s only been in very recent years that excavation has again begun on the site. And I show you a couple of views of the excavation that is currently underway, that is once again revealing some of the original walls, as well as some of the stucco and paintings of the original villa. Now what’s particularly interesting, and where the Getty Museum comes in, is John Paul Getty, when he designed his villa at Malibu–which serves, of course, as a museum of antiquities–when he was building that, he used the Villa of the Papyri as a model, and I mean as an exact model, he really duplicated quite precisely the Villa of the Papyri. This is the plan of the Villa of the Papyri, as it was drawn, when it was originally excavated. And you can see–I guess of the structures we looked at, it’s probably most like the House of Loreius Tibertinus, where you’ll remember there’s a small amount of space given to the house on two stories, and most of it given to a large garden. We see the same idea here, where we have–and you can see it better over here–where we have one area around a court, that has living spaces on the second story, and then the rest of the villa is taken up, in this case, by a huge, hugely long pool, that has statuary and the like around it. Now John Paul Getty decided again to use this Villa of Papyri as the model for the Getty Villa. And this is actually the Getty Villa that you’re looking at here, from the air: a painting of the Getty Villa that you see from the air here. And you can see that it is almost exactly the same, in plan, as the actual Villa of the Papyri. So going to the Getty Villa–and this is, of course, a view of that long pool at the Getty Villa–going to the Getty Villa is like going back in time, to the Villa of the Papyri. And I know a lot of people think this is sort of Disneyland in Malibu, a Roman version of Disneyland. Yes, to a certain extent. But the truth of the matter is you will get a better sense of what a Roman villa looked like, in Roman antiquity, from going and looking at the Getty Villa than you will get from going and looking at the Villa of the Mysteries at Pompeii – only because they have restored, and because it is in such good condition and because they have added to it–the kind of plants that would have been used there. The paintings are in good shape. They’ve placed statuary, actual copies of the ancient statuary that would have been at the Villa of the Papyri; because hundreds of statues from the Villa of the Papyri have survived, and they have–you can see them all at the Getty. I’m going to show you a few views of this, because I think it’s such an interesting topic. I think one could write a very interesting paper on the original villa, as seen through the eyes of the Getty Museum. For those of you who have either been there, or have not been–or have never been there, just a few views. The entranceway into the villa today; one of the ramps. They have just–if you saw this a few years ago and haven’t been back, they have made some additions in the last several years, including their version of a theater–and you can see it here–an ancient theater, which you can see here, with the cavea and with the cunei, or wedge-shaped sections of seats. Two very good restaurants, up above. And then this is a view, standing up on the top of the cavea, looking down toward the orchestra, toward the stage building, which is of course part of the Getty Villa itself. And you see also that it’s very accurate–it looks a little too new–but it’s very accurate, in that they have even used here the typical columns with the white top and the red bottom, that we saw so characteristic of architecture in Pompeii, and also in Herculaneum. A view of another pool, with some famous copies of some famous bronze dancers from Herculaneum; I’ll show you the originals in a moment. This is the Getty’s version of First Style Roman wall painting, along the walls, as you can see here. It’s not quite the same, but nonetheless it conjures up what one of these walls would’ve looked like, if you had it all the way along your corridor. And they have Second Style Roman wall painting as well, and these of course based–they looked mostly at the villa, but when it came to the paintings, they certainly used other models. And if you walk around the villa you’ll able to say: “Oh yes, that comes from the–”. This is a very Ara Pacis like motif, with the garland and the columns and so on here – so Second Style wall painting, in these particular cases. Here’s another example of Second Style wall painting at the Getty, where they have wonderfully incorporated the door and two of the windows, into this Second Style scheme, as you can see here. And here we’re dealing with an atrium, in the Getty Museum, which is based, I think, on a building that I’m sure you all know and learned for the exam, which is which house, the atrium of which house? Which? Professor Diana E.E. Kleiner: Vettii, do you think Vettii? What about this second story up here? Professor Diana E.E. Kleiner: Samnite, Samnite; the Samnite House, with its second story in the loggia, and then with its impluvium and its compluvium. This is really good stuff. And then here, here you see a view of one of the pools, looking back through the doors. They would’ve had the wooden door jambs. We saw those in Herculaneum, preserved. Through that, to the pool, with the dancing women. And then at the very end you see a fountain that is based exactly on the large fountain–I showed it to you earlier this term–at Pompeii. And here this whole concept of vista, panorama, from one part of the house to another, taking advantage of light streaming through the compluvium, onto the pool, reflections in that pool, statuary. This really conjures up, as I said, better than anything I can show you, what an ancient Roman villa actually looked like. There are rooms like this at the Getty, with marble incrustation, that is very much like both marble incrustation we’ve seen, and also like First Style Roman wall painting. Areas like this, where you can see again columns surrounding a garden, with rooms on the second story; paintings, First Style paintings on the wall; statuary in the center. And all of this, again, based on the actual statuary that was found; a great–a huge collection of statues that this particular owner had, that are now on view in the Archaeological Museum in Naples, were copied for this here. And then just another view showing that they too, at the Getty Villa at Malibu, were very cognizant of the siting of the structure, placing it on a cliff, so that you can have a beautiful panorama down from there: very much in line with the way the Romans sited their buildings. And then just quickly, just to give you a sense of how compelling some of the sculpture is from here. These are the originals. This is the head of an original athlete or gladiatorial figure from Herculaneum. You can see how vivid it is, especially–it’s done in bronze–but especially with the inlaid eyes, that were customary for statues of this type. This has got to be the best hair in Roman Art. I love this one. It’s a fantastically dramatic photo of this particular head that also comes from the Villa of the Papyri. And here are dancing ladies. These are the original versions of the dancing women that would have surrounded a pool in the actual villa at Herculaneum, extremely well preserved, and in every possible posture, as you can see here. If villa architecture is your thing, but you’re not interested in the Getty or in Herculaneum, but are an Anglophile and want to do something in England, I’ve got two topics, two British topics. We’re not going to look at Roman Art in Britain. So for any of you who are particularly interested in art in the British Isles, this might be a good topic for you. I have both a villa and a bath. This is the Roman Villa at Fishbourne, in Sussex, England. It’s a model of what that villa would’ve looked like. And you can see that it has a lot in common with the Templum Pacis in Rome, with its great rectangular space and one of the buildings pushed back against it. But one of the questions one would ask for this, as for any buildings that were done somewhere other than Rome: What is based, and how close is this to what’s going on in Rome, contemporaneously? And what is different? What has to do with local practice? If one visits the Fishbourne Villa today, you can still see the mosaic floors that are well preserved here. And you can also–here’s a detail of one of them, which is touted as the oldest to be seen, the earliest to be seen anywhere in Britain, as you can see from the label. And you can even see at the Fishbourne Villa, for example, a private bath, with the hypocaust. So clearly the impact of Rome is clear here. And they even have such elements preserved as these roof tiles that you can see here, on the right-hand side. Another British topic is the Roman Bath at Bath, Aquae Sulis, now in Avon, England. This is a view of the magnificent city of Bath itself, as it looks today. And here’s a view of part of what is preserved of the Roman Bath at Bath; the water as green as the Tiber, as you can see in this view. But this is part of the bath structure, and again what one would ask oneself is–and there are, there’s enough there, that plans of what this bath would’ve looked like exist–and one would ask oneself, “What is this–how does this compare to baths that we saw in Italy? What is it–how does it compare to the bath at Pompeii, the Forum Baths or the Stabian Baths, to the imperial bath architecture of Titus? Are there similar kinds of rooms? What is the construction technique? Who was this used for? Who did this belong to? Who put this up? And what part did it play in the social and cultural environment of the city of Aquae Sulis in ancient Roman times? Another view of that, where you can see some of the stone construction. And then, once again, a very well-preserved hypocaust at the bath at Bath, as well as a very interesting brick arch, that you can see here. So the whole question of technology. What kind of technology is used in buildings like this is an intriguing question. Another great topic, if you want to make your way to the Middle East, to Masada. This is the famous cliff at Masada. I don’t know how many of you have climbed. How many of you have climbed Masada? Anyone climbed Masada? A couple of you. Did you go on the Snake Path? Professor Diana E.E. Kleiner: See you’re so–I didn’t go on the–and I was there a long time ago. So I should’ve gone on the Snake Path, but I didn’t. I went on the cable car. So here–this is what you do when you go and you take the easy way out. You take the cable car up. But you can get some good pictures of other cable cars, as well as of the mountain, as you make your way. But the thing to do is definitely to take the Snake Path up to the top of the peak of Masada, which is steeped in history, as we know. The particular aspect that would be at issue here would be to look at the Herod’s Palace, the great Herod, about whom much is known – a very interesting historical character, who was around in the first century B.C., the time of Julius Caesar and Cleopatra and so on. His palace at Masada, which was built on the top of the peak, is particularly interesting. Given its date, it’s roughly contemporary to the sorts of things we saw going on in Italy, at Palestrina, and at Tivoli the placement of–well in that case, the pouring of concrete on a tiered hillside; in this case use of different materials, as you can see here. But two views of what the Palace of Herod on Masada would have looked like. Again, a tiered structure, multi-tiered structure, roughly three tiers. So the question here is, what did he have in mind? Why did he put it here? Why did he choose to represent it as a kind of cascading structure, from top to bottom? How does it compare to Palestrina and Tivoli? What is it made of; is it made of concrete or is it made of something else? And why in each instance? What kind of architectural elements are used in this particular case? And if I show you a couple of details, you will see that Rome is not too far away, in the sense that once again we see a hypocaust system being used to heat the floor of this particular room, in Herod’s Palace. Was this a bath or was this something else? Remember, we saw the hypocaust also used to heat the floor of Domitian’s dining room, in his palace, in Rome. And then over here, look–wall painting: very similar to what we see in Italy, at roughly the same time. This is again B.C., so we’re talking about First and especially Second Style Roman wall painting, or the transition between First and Second Style Roman wall painting. Tombs, we’ve seen tombs are particularly interesting as a topic, because they’re so varied, and have so much to do with the particular patrons who commissioned them. I showed you fleetingly the two tomb streets at Pompeii, the Via dei Sepolcri and the Via Nucera, and I told you that we would concentrate instead on tombs in Rome. But they make a very interesting paper topic, for someone who’d like to think further about Pompeii, and to think about the variety of tomb architecture in Pompeii. That varies from house–tombs that look like houses, to tombs that have columns in the second story, with statues interspersed among them, to tombs that again have a niche in the center, with statuary–unfortunately headless here–but preserved inscriptions. So if you want to get into who these people were, what we know about them, a kind of cultural study, you could do that. And this is my favorite tomb on the Via Nucera in Pompeii, because it should remind you of something we saw earlier when we looked at Roman tomb architecture. What was that? Professor Diana E.E. Kleiner: The columbarium, the columbarium, the Vigna Codini. But you’ll remember that scheme of placing niches on a wall was for subterranean tomb architecture in Rome. And here we see–it’s just a great idea. They took the idea of the columbarium and they slapped it on the front, on the façade of a tomb. So you see two tiers here of niches. Same kind of portraits that we saw, or urns that we saw, in the Vigna Codini columbarium, brought above ground. Same kind of inscriptions in front of each of them, and made into the façade, this very interesting façade of a tomb, on the Via Nucera in Pompeii. Residential architecture in the Roman provinces. The houses in France at a place called Vaison-la-Romaine; Vasio Vocontiorum in antiquity. The French tout this as the French Pompeii. It is far from the French Pompeii, unfortunately, because it doesn’t have all of those public buildings. It doesn’t have an amphitheater or a theater or an odeon or a so on and so forth. But it does have some interesting houses. The houses are not as well preserved as those in Pompeii. But it’s interesting to look at them. This is a model of one of them, showing the same sort of elements that we’ve seen in Italy: the peristyle–this is the Hellenized domus type–the peristyle court over here. The compluvium of the atrium over here. So it gives you–and then down on this end, a colonnade with a pool in front of it. So very similar to the kinds of things that we saw in Pompeii. This is a view of some of the ancient houses, as they look today, and as they make up part of the modern town that surrounds them, in Vaison-la-Romaine. You can see that they’re not–they’re preserved, only the foundations essentially are preserved. But enough of them are to give us a very good sense of the plans, the architectural plans of these. And it can be interesting to look at these in connection to what we have from Pompeii, and to see how they stack up, and to whether they are different in any way, because of the fact that they were put up in what was ancient Gaul and not in Italy. And here a view of one of the peristyle courts of one of those, as well as a mosaic. And if you look at what remains of the wall painting, you can see that that is completely consistent with what’s going on in Italy at the same time. Option 2: I’m not going to go into in any detail, but you’ll see when you look on the website for Option 2; that that’s called “Select a Building, Select a Theme.” If there is nothing here that you liked, but you do want to do a research paper, and there is some building that you’ve seen on your travels, that we haven’t talked about in this course, or even a building that we have talked about in this course, but talked about in a few minutes time, that you would like to write a paper on, for some reason, you may do that; and you would do it in the same way that you do the first one. It would be a research paper. You’d do–you will need to get permission from me, for which one you choose. You can do this either directly to me, by email, or via the teaching fellows; you can go to them and they will likely be able to be my surrogate, if the idea is good. And if they have any concerns, they will let me know and we’ll talk about it, and we’ll let you know. It would only be–the reason I want you to come to us is just because if we think that there’s absolutely no–there’s nothing to read on it, it’s going to be very hard for you to do, we want to alert you to that. We want to make sure you choose something where there’s a lot to think about and a lot to do that will be a fruitful experience for you. So that’s Option 2. And then Option 3 is by far–oh, I forgot one, I’m sorry. Very quickly, the last topic under Number 1, the Tower Tombs at Palmyra; we already talked about Palmyra in Syria. You see that these tombs here are very distinctive, these tall tower-like tombs, which is why they’re called tower tombs. Here’s one of them here, made out of local stone, very stark, usually with a niche in the center, that sometimes has a representation of a deceased member of the family lying on a bed. And here the interior of one of these: very ornate; a coffered ceiling with paintings, with portrait paintings in the top; and then a series of niches where you see either single portraits or group portraits of members of the same family, sort of like what we saw on the outside of tombs on the Via Appia, in this case on the inside of tombs. This would be an interesting topic for someone who would also like to use, to go actually look at something at the Yale Art Gallery, because we have some of the portraits that come from these Palmyrene tombs in the Yale Art Gallery. I show you one example of one of those here. The last topic, my favorite by far, and I really urge–this is a tremendous amount of fun–so I really urge as many of you as possible, who would like to be truly creative, to choose this topic. It’s “Design Your Own Roman City.” You’re an architect, city planner, you’re competing for the major commission of your lifetime. I’ll let you read the rest of that on the website. A colony of 10,000 people. You can build this anywhere in the Roman world that you want. So if there’s a particular place you’ve enjoyed vacationing and you want to put it there, because you know that place well, that’s fine. And you can almost do anything that you want to do. You can be as creative and zany as you want to be, as you do this. The only thing that I ask–and you do need to do a paper along with this as well, which is a paper that you’ll see from the–so there need to be drawings, which are either hand drawn or computer generated. That would usually include the city plan itself–although it doesn’t have to–and a selection of buildings. So it’s going to take you some time to do. Obviously if you’re skilled at drawing, or you’re an Architecture major, you’re going to be able to do this more readily than someone else. But I just want to urge those who don’t–we had one project basically with stick figures one time that was really fantastic. So even if your drawing skills are not great, it’s the ideas. Will we be impressed by great drawings? You bet we will. But I don’t want to discourage anyone for whom drawing is not your forte, because I think it’s really the ideas that count, the creativity that counts here. But you can choose any location–oh, I mentioned that there’s a paper that has to describe the colony, the reason for its construction, giving its name–and again, be very creative here–its date, its location: Italy or the provinces. You can pretty much put anything you want in these cities, but in that paper you have to explain why. For example, if you were to build a town in Asia Minor, and it were to be filled with concrete buildings–which none of these towns were–you have to explain why this particular town is filled with concrete buildings. And you can come up with as crazy an explanation of that as possible; in fact, the crazier the better. But you need to explain something like that, so that we understand that you know there was no concrete architecture in this part of the world, but this particular town is special because of the following reasons. So I think you can see how your creative juices can flow. I just want to show you very quickly, in the few, five or six minutes that remain, a series of these that were done by students over time, just to serve as a–I hope they won’t be intimidating–but rather to serve as an inspiration. There are a couple of them along the way that were done by students of Architecture, that are particularly good in terms of the drawings. But others you’ll see are quite simple, and I want to show you to not be intimidated by this particular topic. This is a wonderful city that someone created on a harbor. You can see the docks. You can also see the Port Authority that has been added here, as well as the warehouses. There’s some misspellings, like cenaculae over here; Livian Baths, I guess after Livia. But look at this wonderful forum where we have a temple pushed up against one of the back walls. For some reason there’s a tetrapylon in the middle of the forum, which kind of works for this street, but I’m not exactly sure where it goes, here; but it’s an interesting motif. And then this market, this sort of interesting circular market that kind of projects on one side, creating a very interesting shape; gives you some idea. And a very regular plan, as you can see for this particular city. This was done by a graduate student actually, in the Architecture School; very extraordinary drawings, and it was a huge plan. But just to show you again how creative it was, the City of Ultorium, after Mars Ultor, of course. And you can see some wonderful motifs, and all of them identified here. This large temple, a tetrapylon, there’s always a fascination with tetrapylons in this project; some other structures over here, including a marketplace at 7. But I love, at 6, the curia; you never see a round curia, but this is a round curia, which is absolutely terrific, opening off the basilica, which you see over here, which is very closely based on basilican architecture of the Trajanic Period, and into the Severan period. Some interesting wedge shaped shops over here. So again, it gives you some sense of what’s possible. This, not by an Architecture student, but another one of these port cities that has–I love this–the sunken theater; you can see the sunken theater that goes right into the sea, over here, on this side, but as well as the port. You can see this was a Flavian–so again, you got to decide where you want to put it, which period–the Flavian period, so a Flavian port city. This, another one, also I think from that same project, where you can see the Flavian basilica; a Capitolium with a Temple to Jupiter, Juno, and Minerva. And then Titus is honored over here, with his statue, and a couple of victory statues, one on either side. Again, I think from the same project, this is the city itself, where you can see it has an amphitheater, it has a basilica and a forum, and it also has a colonnaded courtyard, a colonnaded street. If you build a colonnaded street in a town in Italy, you’ve got to explain why this is the only colonnaded street in a town in Italy. If you put it in the East, it’s obvious. Same project I think again, the–it should be the Thermae Titi and the Library. But I love this because the person has identified the stone. In the amphitheater here, stone has been imported from all over the world, from Syria and from Ephesus, to be used in this particular structure. An arch–again I think also; this was a very ambitious project–an arch from that same project, with a victory at the top and an inscription. And then this, the victory gate, again with the amphitheater in the background. This was something simpler but interesting: a small fountain; composite capitals; coffered, misspelled; apse; a philosopher pose of Titus; scalloped pool, with a triple basin. This one, very simple and very derivative in a way; but I love this one anyway. This house plan shows us that the person was basing it on which house? It was actually on the exam, although you didn’t see the plan. Professor Diana E.E. Kleiner: House of the Mosaic Atrium, because remember up at the top, the entranceway, the atrium and the oecus at the far end, in the form of a basilica. So a very derivative plan. But I just love this touch; just this touch did it for me, sticking those two palm trees in the center of the peristyle court was great. And I forget again exactly where this town was, but it had something to do with that particular–the kinds of flora and fauna of that particular part of the world. This was another wonderful one. A big city plan; a huge piece of oak tag, with the entire city, a city of the Severan period, Septimius Severus, with buildings honoring him and his son, Caracalla, for example. But this one, because Septimius Severus’ wife was particularly interested in astrological signs and used to tell him each day what his day was going to be like, based on those signs, the student incorporated elements of the Mithraic Mysteries, and those astrological signs, as you can see here, in many of these buildings: a Mithraic garden, and so on and so forth, which was really wonderful. This was great. This was someone who made a book, and included in it was kind of a treasure map that included a preamble to where this city was. And interspersed within this–and it was made to look very old, as if it was just discovered by Harrison Ford himself. And we see these wonderful plans interspersed with the text. Then this, a small simple house, again with some wonderful wall paintings, of I guess the Third Style. So he was presenting his case to me about this city that he wanted to build, and was I going to give him permission to build it? So interspersed with this text were these wonderful drawings of what he had in mind. So, I mean, there are so many–this is one of many, many wonderful ones that I’ve gotten. I hope this will be inspirational to you. I can’t say, “Have a great break” quite yet, because we have class on Thursday. But I know you’re all looking forward to it, and I hope that your travels can in some way include–even if you’re just going to the beach in Cancun–I hope it can include, in some way, thinking about buildings and about this project. Thank you.